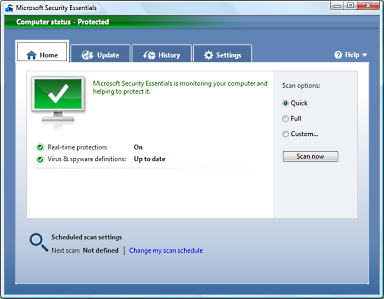 Microsoft Security Essentials (MSE) is a free antivirus program created by Microsoft for Windows XP, Windows Vista, and Windows 7, that provides protection against viruses, spyware, rootkits, and trojans. It replaces Microsoft's Windows Live OneCare (which was subscription-based) and Windows Defender (which protected only from adware and spyware). Hardware requirements for MSE, depend upon the operating system. For Windows XP, it requires at least a 500 MHz processor and 256 MB of RAM. For Windows Vista and Windows 7, it requires a 1 GHz processor and 1 GB of RAM. For any Windows version it requires 140 MB of free disk space, a VGA display resolution of 800 × 600 or higher, and an Internet connection. Before it installs, MSE checks that the installed Microsoft Windows is a legitimate registered copy. It will then disables the old Windows Defender and sets Windows Update to its fully automatic mode. Allowing Windows to automatically install updates can cause problems, so you probably want to turned it off again through the control panel. Virus definition updates are published three times a day. Using default settings, archived files are decompressed, and then scanned. File downloads and e-mail attachments are also scanned. If an application exhibits suspicious behavior, Security Essentials Dynamic Signature Service attempts to better identify malicious files by checking for updates. Testing by AV-Test found that Microsoft Security Essentials detected and removed all malware samples. It also generated no false positives — it didn't flag any clean file as being malicious. Before taking action against a suspect file, it prompts for user input. If no response is received in ten minutes, then the suspected malware is handled according to its default action, letting Security Essentials determine what to do with the malware. System Restore points are created before removing found malware. Paid antivirus program vendors Symantec and McAfee claim their offerings are better than Security Essentials (however, I think if they want to stay in business they should consider switching to the video game business). I personally have been using AVG Technologies free antivirus software and found it very good, but I will still be switching to Microsoft Security Essentials in order to avoid AVG's constant nag screens to switch to their paid version.